I usually take my camera with me on the road. I like taking pictures, and having a camera helps to keep me alert for interesting photo opportunities. 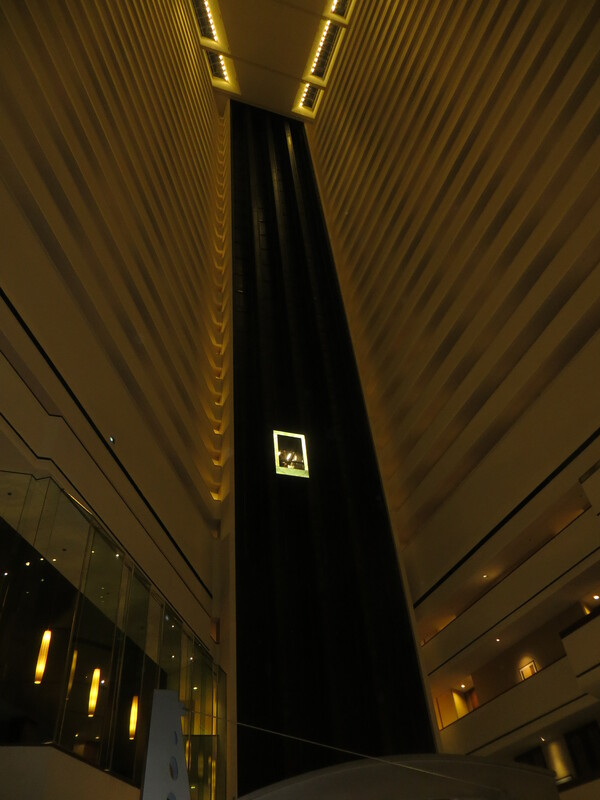 Last night, I was struck by the appearance of the lighted elevator units going up and down in the cavernous atrium of the Houston Hyatt Regency. With the interior lighting set at twilight levels, the elevator banks looked like a kind of gigantic video game — so I took a picture. As I was snapping a photo my dinner guest, the Opera Buff, arrived and made some gibe about my tourist tendencies. We laughed, but she was absolutely right. I’m in touch with my inner tourist, and I’m not ashamed to admit it. The story about the crash of a hot air balloon near Luxor, Egypt — an incident that killed 19 people and seriously injured several others — is one of those odd, faraway stories that nevertheless hits home for me. I’ve never been in a hot air balloon, nor have I ever been to Luxor, where the fabulous Valley of the Kings is located. But, I could very easily see myself visiting Egyptian antiquities and being tempted to take a balloon ride that would allow me to get a bird’s-eye view of all of the sites. Such tourist options — like the opportunity to go parasailing in the Caribbean, or go skydiving, or engage in similar kinds of novel vacation activities — are so commonplace that we tend to assume that they are extraordinarily safe. But, of course, things can go wrong, and if they go wrong when you are in an unsupported balloon a hundred yards in the air the consequences are more likely to be devastating than if they go wrong when your feet are on the ground. The Luxor balloon was close to landing when a rope got wrapped around a fuel tube and severed it, causing a fire. The fire produced heat that rose into the balloon, causing it to shoot up into the air. Some passengers jumped out; others remained helplessly on board as the balloon rocketed skyward, the gas canister exploded, and the balloon then plummeted to the ground.